Critical needs facilities such as hospitals, police and fire stations, emergency shelters, and operations centers play a vital role in providing services 24 hours a day, seven days a week, especially after a catastrophic event such as an earthquake, hurricane, or tornado. To do so, the equipment within those facilities must go beyond surviving an event to remain in operation after the event is over. The International Building Code (IBC) addresses seismic design requirements for both buildings and systems attached to the buildings, including electrical equipment. While the IBC is not a government mandate, its adoption has been encouraged, and in some cases required, to ensure funding coverage by the Federal Emergency Management Administration (FEMA). All state and many local authorities have adopted a version of the code, which is updated every three years. A large HVAC manufacturer was awarded a contract to provide air handler systems with Variable Frequency Drives (VFDs) for a major university hospital. While VFDs are an effective energy management tool and help run electric motors more efficiently, they also introduce harmonic distortion. Adding to the complexity of the project was the fact that the system needed to be certified to comply with seismic requirements due to the location of the hospital facility. According to the IBC, hospital-related critical equipment needs to be designed, constructed and installed not just for anchorage but for full proven performance operation after a seismic, wind, or flood event. MTE commissioned seismic testing of the Matrix AP Harmonic Filter to meet IBC standards. Compliance with the seismic provisions of the IBC requires either shake-table testing or mathematical modeling to establish whether the product can withstand the required amount of seismic activity. This resulted in the approval for the 2012 IBC Special Seismic Certification of Non-Structured Component and Systems. The seismic certified Matrix AP Harmonic Filter enabled the supplier to meet the strict seismic building codes, ensured the hospital facility would have uninterrupted performance, and allowed the building owner to protect their investment with funding coverage from FEMA should the need arise. harmonic reduction and energy savings. MTE delivered cost-effective proven performance for a critical needs facility at 40% less than the competition! 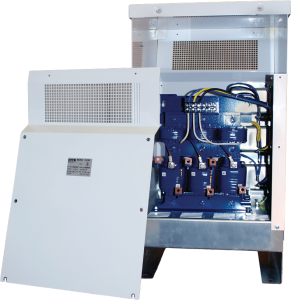 480V, 6A – 103A, NEMA 3R and all associated contactor options. Special Seismic Certification (SSC) is an approval process in which equipment and nonstructural components are evaluated for their ability to withstand the effects of earthquakes and meet functional requirements following these events. Seismic analysis and shake-table testing were conducted in accordance with strict adherence with the following building codes: 2012 IBC (International Building Code) , ASCE 7-10 (American Society of Civil Engineers), and 2012 ICC AC 156 (International Code Council). MTE’s seismically-certified Matrix AP Harmonic Filter is approved for seismic applications when properly installed, used as intended, and located in North America where the design spectral Response Acceleration at Short Periods, SDS, is less than or equal to 2.0g. Installation below grade, at grade, on roof-level and any location in between is permitted and included in this approval (Installation Elevation Ratio, z/h = Installation Elevation/Total Building Height). Installation in essential facilities and for life safety applications, both requiring post event functionality, are also included in this approval as appropriate for systems with a Component Importance Factor, Ip, equal to or below 1.5. The maximum certification parameters for the building codes listed above for MTE seismically-certified filters are SDS=2.0, z/h=1.0, and Ip=1.5.